We are very happy that the move went without a hitch. The efficiency and professionalism of your people was amazing. My kids were thrilled by the Big Foot. They want to meet Big Foot again, that is you! Moving an office is a full time project that requires superior organization and preparedness. 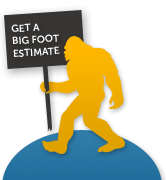 Big Foot Moving & Storage, Inc. appreciates the magnitude and uniqueness of this type of relocation. We created a checklist including some of the most common tasks to assist you in moving your business. In addition to identifying and communicating floor plans, furniture placement, electrical/data/phone configurations, you may also consider taking the opportunity to thoroughly clean all office equipment. Color code labels for items belonging in network rooms or other common areas. Each color should correspond to a unique common space in the new location. At the new location the color should be clearly present on the door or wall space next to the door for easier unpacking. Contact vendors for 800 numbers and schedule cutover date. Test the new phone lines several days before the move. Determine what type of Internet is available at the new location. If a T1 is required 6-8 weeks is often required notice. You should not transport the backup media in the moving truck. Carry that by hand and if possible have two copies in two separate locations. Review equipment repair orders and identify those items that are likely to have a problem on move day. Test those items first. Create a contact list for move day and include all key personnel, vendors, etc. on this sheet. Provide copies of this contact list to all team leads. Create a phone number list of all numbers being moved. Use this list to test calls coming in to the correct locations in addition to making sure outgoing calls can be made. Schedule a conference call with telephone service providers. Review plan for move. Schedule disconnection date for old location. Reconfirm move date with all vendors at least 1 month prior to move. The week before the move make sure all vendors date sensitive tasks are complete and move is still on track. Have a team meeting and confirm time lines are being met and roles and responsibilities are understood. Ensure everyone knows whom to call if there is a problem. Update important information with office security systems and providers. Have users back up all of their files to the network or to disks before the move.